This is a sponsored post written by Niki for Deals.DollarTree.com. Are you gearing up for the holidays too? It’s almost prime shopping time, and the kids are probably getting excited about a visit from the big man in the red suit. If you haven’t started already, you might discover that some of the best deals this season are in children’s toys and small kitchen appliances at the discount store. If you’re struggling with exactly which toys to get for your kids or you need a few supplementals for their must-haves, some traditional toys that never go out of style are dolls, tea sets, train sets, trucks and race cars. Having a doll to play with opens doors to some landmark experiences, from accessorizing with outfits to having a soul mate to confide in. There is always occasion for a tea party, another rite of passage, and toy trains offer a fun way to visit the Land of Imagination. Trucks and race cars a staple for nearly any toy chest, and are a great way for kids to learn how to make their own sound effects. Older children might like to try a tabletop pool table or an air hockey game. If you’re interested in family fun, small kitchen appliances are the path to adventures in baking. From the slow cooker that’s perfect for melting chocolate for dipping or simmering hot spiced cider after caroling to the tall electric can opener that easily handles family-size fruit cocktail cans, you can find some great shopping deals just in time for the holidays. The latest trends in seasonal home decorations this year are garland lights, icicle light sets, red and gold jumbo plastic ball ornaments and indoor-outdoor lighted gift boxes. It’s time to deck the halls! Nikki is an independent writer for Deals.DollarTree.com. Deals offers low prices on everyday essentials, party supplies, pet products and more. I absolutely love Christmas shopping. they have those trains at the dollar tree??? I so am adding them to my Black Friday Christmas shopping list! I’ll be heading there for Santa’s Workshop! Dollar Tree is my go to store for the majority of my holiday needs – paper – ribbon – school treats! In fact yesterday on the way home I stopped and loaded up with boxes and ribbon. I was in dollar tree the other day getting some things and I was surprised at the good quality of their baking items! We love Dollar Tree. My mother-in-law can find the coolest stuff for crafting in that store. They have great stuff for the holidays. I love Dollar Tree, I will definitely be in there a lot this holiday season. Thanks for sharing the scoop! I haven’t even started my Christmas shopping. Looks like Dollar Tree has some great deals. I will have to hit Dollar Tree. They have some great gifts! I haven’t stopped into Dollar Tree recently. I’ll have to pop in and take a look at their holiday stuff. 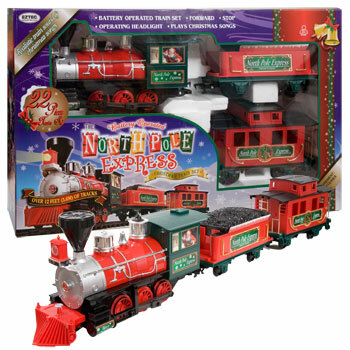 That train set is too adorable, I know what I will be getting my nephew for Christmas this year! I can’t wait to surprise him! We have a similar train like that that goes around the tree on Christmas morning! I purchased some craft supplies at Dollar Tree recently. So much cheaper than other stores! Best time of the year to get deals! Our family loves Deals! In fact, my husband just got back from Deals with some snacks! I love their Holiday selection and get ribbon for our Christmas tree from there every year! I had no idea Deals existed! Thanks for introducing me to this store! I love Christmas shopping and Christmas decorating! These are great ideas! I can’t wait to finish up my shopping this month!! 🙂 Great tips! I will have to check Dollar Tree out and see if I can find some gifts there for my family this year. I need to get started. These are all great gift ideas! 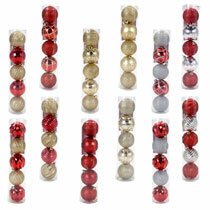 I love buying decorations at Dollar Tree since my kids always break ’em! No Hallmark ornaments here LOL. I loved tea sets so much! And Barbie doll houses..I had like 5 of them 🙂 Great ideas! I can’t resist going out to pick up some more holiday decor. You got me thinking of it again with your seasonal trends! Oh I love the dollar tree so much! That’s such a cute train set! I love finding great deals on Christmas shopping. Sure wish we had a Dollar Tree here.